3 Reasons Why You Shouldn’t…. As I have no intention of running a marathon unlike my super fit friend J, (who was in fact an iron woman, before the term was ever coined), I thought I would adapt this advice for a more normal likelihood in the JCR household. 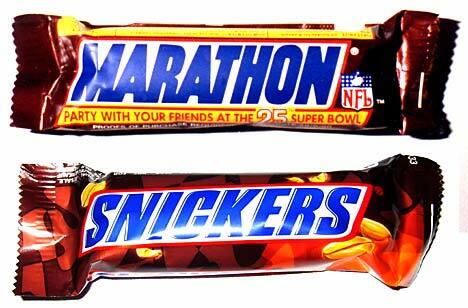 this is because you have forgotten to buy the Marathon/Snickers bars in the first place. Next time, be prepared and buy a family pack, that should do a whole week of running. running with chocolate requires dedication, first of all you need to practice the unwrapping whilst running. Secondly, you can’t run with chocolate on hot days, it’s just plain nasty. Smudged chocolate on your hands could get you arrested for indecent running. If your need to run with chocolate occurs in the summer months, you are unlikely to have sufficiently cool enough days to practice. Unless you live in the UK of course. in the JCR household, first in the cupboard gets first dibs at the chocolate. Many practice sprints help your access to the goodies, this is technically called ‘interval training’. As any seasoned runner knows, interval training is a crucial tool to help with Marathon running. Well it was golden material….and in truth me neither not the Marathon or with one..